Wild guess, but is that Ubly? railrod1949 wrote: North side of Plymouth? Not in Plymouth area. 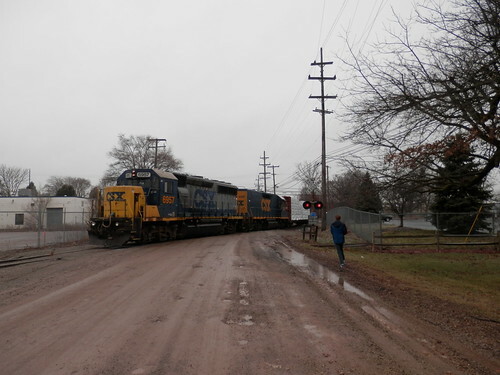 Somewhere along the CSXT trackage right on the CN between Flint and Port Huron? If not, hints please. Way north of Plymouth. Just north of Flint, looking south from Groveland Avenue, just east off Dort Hwy. M-54, just north of the CSX RR bridge over M-54, south of the split with the former old main line to the old main Buick plants. Is it St. Louis? Bear Truss. What's the fertilizer place called now? That is Bear Truss in St. Louis. I took the picture from the intersection of Saginaw and Hubbard Streets in February of 2012. The Bear Truss website offers no information regarding fertilizer production but this was a Royster facility at one time. A&E Ag LLC was acquired by Timac Agro and is still listed on the City of St. Louis website but the provided link to the company is dead. pbmaxno15 wrote: That is Bear Truss in St. Louis. I took the picture from the intersection of Saginaw and Hubbard Streets in February of 2012. The Bear Truss website offers no information regarding fertilizer production but this was a Royster facility at one time. A&E Ag LLC was acquired by Timac Agro and is still listed on the City of St. Louis website but the provided link to the company is dead. Yes, it's Bear Truss in St. Louis, Gratiot County, On the north side of M-46. The spurs is off the connection with the Mid Michigan RR (former C&O Railway trackage). Passenger train on that trackage between Grand Rapids and Saginaw via Greenville and St. Louis, was discontinued many years ago. Last edited by railrod1949 on Thu Feb 14, 2019 11:05 am, edited 1 time in total. The Ag portion of Bear gets fertilizer and salt/ice melt IIRC. ~Z~ wrote: Where be it? AARR wrote: Somewhere on Hamilton Branch? Not Hamilton branch, nor in western michigan. On IN west of Hillsdale? Near Jonesville? ~Z~ wrote: Somewhere on Hamilton Branch? Not Hamilton branch, nor in western michigan. AARR wrote: On IN west of Hillsdale? Near Jonesville? Not on the IN in Hillsdale or Jonesville, but it is in a central Michigan location. JAIL between Jackson and Mason? On IN west of Hillsdale? Near Jonesville? Not on the IN in Hillsdale or Jonesville, but it is in a central Michigan location. Right general vicinity, not on the tracks that run between Lansing and Jackson though. Yes, that's E. Henry Sreet and the Charlotte Southern RR crossing both looking east, in Charlotte, Eaton County. That trackage was the former Michigan Central, former NYC, former Penn Central RR, now Charlotte Southern RR. Final run of the remaining fromer MC, later NYCRR passenger train nos. 388/389 the Beeliner, between Jackson and Grand Rapids with stops in Eaton Rapids and Charlotte, was made on April 25, 1959. Another street to the right is Maynard Street. blueheron13 wrote: Where is this location?